KeyScrambler encrypts your keystrokes in the kernel and decrypts it at the destination application, leaving Keyloggers with indecipherable keys to record. For your personal office, family, and business, KeyScrambler adds a reliable layer of defense. When you try do something online, for example access your checking account on your bank's website, your keystrokes will travel along a path in the operating system to reach the destination application. Many places along this path, malware(keyloggers and Rats or simply keyboard hookers) can be physically or remotely installed by hackers to log your keystrokes so they can steal your user name and password and this is really a very dangerous threat. 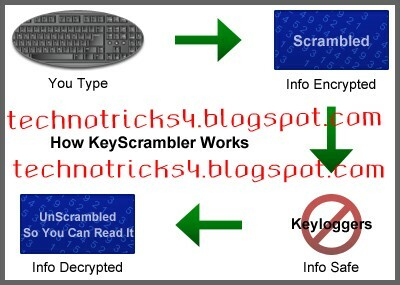 How does key Scrambler Work? Any Idea, yes most of you might know that but today i will disclose the internal details of key scrambler step wise. 1. As you're typing on the keyboard, Key Scrambler is simultaneously encrypting your keystrokes at the keyboard driver level. Because Key Scrambler is located in the kernel, deep in the operating system, it is difficult for keyloggers to bypass the encryption. 2. As the encrypted keystrokes travel along the crucial path, it doesn't matter if they get logged, or whether the keyloggers are known or brand new, because your keystrokes are completely indecipherable the whole time. 3. When the encrypted keystrokes finally arrive at the destination app, the decryption component of Key Scrambler goes to work, and you see exactly the keys you've typed. 1. Key scrambling is not key stroke obfuscation. Actually key scrambler uses cryptography (namely state-of-the-art cryptography) for encryption and decryption which makes it a reliable defense against keyloggers and api hookers. 2. Key scrambler does not depend on type of keylogger or signature of keylogger. But some advanced keyloggers nowadays bypass key scramblers too, so never rely completely on key scramblers. Note my word: " Prevention is better than cure", so keep yourself protected and avoid being prey to any such noobish trap.